You are currently viewing archive for July 2008. The National Post reports that the Yankees have traded short stop Alberto Gonzalez to the Nationals for 22 year old pitcher Johnny Nunez. Nunez is 2-8 this year with a 4.85 ERA between Single- and Double-A. Joel Sherman reports that Chris Britton has been called up to fill in for Kyle Farnsworth. That is all. The Red Sox have traded Manny Ramirez to the Los Angeles Dodgers in a three-way trade that also involves the Red Sox getting Jason Bay from the Pittsburgh Pirates. Details to follow. Update: The Pirates will receive Andy LaRoche and right-hander Bryan Morris from the Dodgers and outfielder Brandon Moss and releiver Craig Hansen from the Red Sox. If you're a Yankee fan, you had to feel good going into this one, with Joba Chamberlain on the mound facing Dennis Sarfate. Joba Chamberlain delivered another good outing and the Yankees' bats pounded on the O's en route to a 13-3 victory that ended their losing streak at 3. The Red Sox lost yet again to the Angels, so the Yankees moved back within a game of Boston for the A.L. wild card lead. Joba was solid again, this time going six innings and allowing two runs on five hits and striking out six. Chamberlain improved his record to 4-3, and the Yankees are now 8-3 in games that he's started this season. The Yankees took advantage of the Orioles' bullpen, as they scored four runs in both the 6th and 7th innings to account for eight of the Yankees' 13 runs in the game. Bobby Abreu lead the way with two homers and 3 RBI. Alex Rodriguez and Xavier Nady also drove in two apiece. The Yankees will face the MLB-best Angels tonight for the first time this season. The Yanks have ten games remaining with the Angels this season (that's almost 1/5 of the schedule), so let's hope they don't share the same ill fate as their A.L. East rivals, as the Red Sox have lost 9 straight against Los Angeles (of Anaheim?). Andy Pettitte will be on the mound and his counterpart will be the Angels' Jon Garland. Game starts at 7:05 ET. 07/31: Kevin Millar Calls Edwar Ramirez "Really Good Hitting"
"One hundred percent [he threw at me intentionally]," Millar said. "I was upset they threw him out of the game because he’s really good hitting. He’s a cute little fellow, he doesn’t throw that hard and he doesn’t have very good stuff. So it’s probably a good idea they threw him out, because it probably would’ve been in Monument Park." Alrighty then. For his part, Ramirez called Millar a "very good guy," before learning of these remarks. After he heard about them, he said, "I apologize if he thinks that." Abraham notes that Millar is 1 for 4 against Edwar with three strikeouts. In any case, LaTroy Hawkins was traded to the Astros for minor league 2B Matt Cusick and cash. The kid is hitting .284 /.357/.454/.811 where the league OPS is .700 so clearly, he can hit (at this level). He was drafted by the 'stros in the 10th round of the 2007 draft after spending 3 years with the USC Trojans (played with IPK). Seems like a Chris Malec, #2 professional hitter type...but I'll leave the analysis to the pros. On further reflection, he seems like more of a Justin Synder type with a little more pop and a little less versatility in where he can play. We'll see where he goes, though I expect it will be Charleston...unless Malec moves to AAA and they move him up to AA (though I doubt that will happen). Update: Here was the draft profile of Cusick. With his bat control and outstanding makeup, Cusick should get plenty of attention and could be a nice No. 2 hitter in the future. His ability to hit for average and get on base should appeal to the stats-hungry crowd. Man, I'm amazed that the Astros gave up anything decent for someone who was just designated...way to go Cash. Tigers Thoughts had put a post about Pudge a couple days ago that has a lot of implications for the Yankees this coming offseason. Applying my formula to this upcoming class, here is how I am projecting the Elias Sports Bureau would rank the American League Catchers if the season ended yesterday.The top 7 would qualify as Type A players, while the next 7 are Type B. Martinez and Posada are in the midst of injury plagued seasons, while guys trailing Rodriguez such as Jason Varitek and Kenji Johjima are struggling this year. As a result, I am fairly confident in saying that Ivan Rodriguez will be a class A player this offseason. This means the Tigers would get a sandwich pick and a first/second round pick if he signs with another team after being offered arbitration. Now, I don't know if the Yankees would offer Pudge arbitration (with his age, he just might take it if he gets no other offers, right?) but I do know that the Farns definitely wasn't a Type-A free agent. So, if this all works out perfectly, the Yankees could have just traded Kyle Farnsworth for Pudge and a couple of very high picks. Not too shabby. I'm not joking. Really, I'm not. The deal is complete and was announced on YES during the Yankees' pregame show. Joe Girardi said during the postgame interview that he had made Farnsworth aware of the deal and that it was "very tough." Man, as much as I've killed the guy over the last three years, I've started to take a bit of a liking to Professor Farnsworth. I guess he became more expendable after the deal for Damaso Marte, however. Pudge still has a little bit left in the tank, as he's put up a line of .295/.338/.417 and is still very solid defensively. My friend Jared W. Smith attended tonight's game between the Yankees' Single-A affiliate, the Charleston RiverDogs, and the Asheville Tourists, an affiliate of the Colorado Rockies. The game was noteworthy for marking rehab appearances by both Carl Pavano and Phil Hughes. Jared agreed to write an exclusive guest post to YanksBlog.com, sharing some pictures and detailing what he saw. 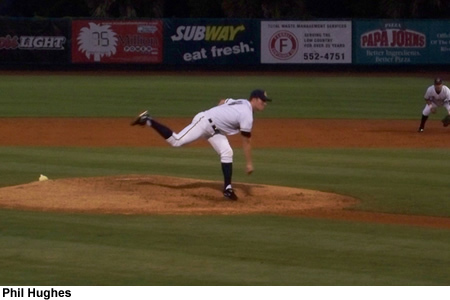 Philip Hughes and Carl Pavano each made rehabilitation appearances for the low-A Charleston RiverDogs in their 4-2 win against the Asheville Tourists Tuesday night at Joseph P. Riley Park in Charleston, SC. The rehab assignments were the first for the South Atlantic League team as a member of the Yankees' farm system. The much-maligned Pavano, who has been under constant fire for his lengthy stays on the disabled list spanning a majority of his four-year, $39.95 million dollar contract, is working his way back from Tommy John surgery. 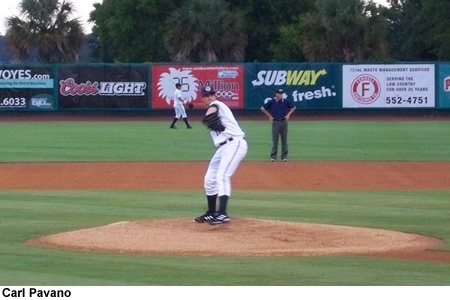 Pavano got the start for the RiverDogs and threw two shutout innings, giving up one walk and one hit while striking out four. His velocity was down - his fastball touched 90 about three times with his typical fastball coming in at 86 to 88 - but it was enough against the Tourists' hitters. Pavano gradually mixed in some breaking and off-speed pitches, and was effective with them, striking out the side in the second. Despite the drop in velocity, Pavano was sharp and had good command of most of his pitches, which should be incredibly encouraging considering the layoff. Philip Hughes came on in the 3rd inning, also starting primarily with fastballs and sinkers. He hit 93 consistently on the stadium's gun through the third, working around a hit to retire the side with two ground ball outs and a flyout. In the 4th inning, Hughes began to throw his breaking pitches, which were a bit rusty at first, as he walked the leadoff man. Hughes found a groove with the next batter and got a double play ball to end that threat. In the fifth, he struck out one and got another ground ball out before surrendering a triple to Tourists catcher Lars Davis; Hughes was able to induce the next batter to fly out, ending that threat and his evening. Hughes threw three shutout innings, scattering two hits and walking one, with one strikeout. It was an efficient outing for Hughes; so efficient, in fact, he had to pitch the fifth inning because he did not reach his prescribed pitch count (roughly around 25-30) in the third and fourth. The game was delayed by a half hour to a 7:30 start as showers and thunderstorms lingered around Charleston for much of the afternoon, as if Carl Pavano needed another impediment to getting back on a mound! Luckily for Pavano and the RiverDogs, the weather abated itself by the first pitch. Rain resumed in the fifth inning, sending fans (including yours truly!) scurrying to more covered locations, but that also abated and the game went on to a full nine innings. The appearances are encouraging, though it's still too early to tell when they'll be back to the Yankee rotation. A healthy Hughes and perhaps even Pavano could only help the Yankee pitching staff as it bears down for what promises to be an intense dash to the AL East pennant. On Tuesday night, after 6 innings, Darrell Rasner had a nice line and the Yankees were only down by a run, 2-1, with the lone run coming on an A-Rod homer. But, to start the seventh, he went right into trouble, allowing a single and hitting a batter. Damaso Marte was brought in to stop the bleeding, but was ineffective, allowing a single, double and double, before making an out and going on to retire the Orioles. After all was said and done? 6-1, Orioles. Veras threw a 1-2-3 inning with 2 strikeouts in the top of the 8th and the Yankees chipped away at the Orioles lead with a 2 spot in the bottom half of the inning. Cano drove in both runs, scoring A-Rod and Abreu on an RBI single. Unfortunately, with Jason Giambi on second, Wilson Betemit, Melky Cabrera and Xavier Nady went down in order, leaving the 'Stache stranded. That would come back to bite them. Mariano pitched the ninth and yet again, in a non save situation, he allowed a run. He gave up a lead off homer to Aubrey Huff in the 9th. This run would also come back to bite the Yanks. Heading into the bottom of the 9th, the Yankees were down, 7-6. They got off to a quick start with a Johnny Damon single, Derek Jeter walk and Bobby Abreu RBI double scoring Damon. A-Rod made the first out with a strike out. Jason Giambi came through with a single, scoring both Jeter and Abreu and putting the Yankees down a run with a man on first and 1 out. Justin Christian pinch ran for Giambi and stole second. The tying run was at second base with Cano and Betemit due up. Both of them struck out and the game was over. Joba Chamberlain (3-3, 2.30) will pitch against Dennis Sarfate (4-1, 3.78 ERA) tomorrow at 1:05 PM ET in the final game of the 3 game set with the O's. Monday night was not a fun night at the Bronx if you are a Yankee fan, as Mike Mussina was knocked around by the Orioles in a game reminiscent of their brutal loss on May 20. After winning eight in a row, the Yankees have now been outscored by a total of 16 runs in their last two games. The Red Sox and Rays both lost, however, so the Yankees didn't lose any ground on either of the division or wild card races. Mussina had another forgettable outing against his former team, as he was tattooed early and often. Moose went only five innings, allowing 8 runs on 6 hits. His E.R.A. jumped 30 points from 3.26 to 3.56. The one bright spot of the game came in the 7th inning, when Xavier Nady broke an 0-9 slump since becoming a Yankee with his first home run in pinstripes. Johnny Damon also homered in the inning. It was Damon's first home run since May 27. Well, I guess it's no harm done since both Boston and Tampa Bay lost. Time to get out there tonight and hopefully make last night a distant memory. Darrell Rasner will be taking the mound tonight and his counterpart will be the Orioles' Daniel Cabrera. Game starts at 7:05 ET. Tonight, Phil Hughes and Carl Pavano (!) will both be making rehab appearances tonight for Single-A Charleston. I have a friend who will be attending the game and he'll be making a special guest post here afterwards. So, check back late tonight or early tomorrow for that. The unfortunate likelihood has become a reality: Jorge Posada will have season ending surgery to fix his his right shoulder. I really didn't want to put together a write-up for this game. Suffice it to say that this game proved everyone's thoughts on Sidney Ponson. He is doing it with smoke and mirrors and it was only a matter of time before his luck ran out. Sir Sidney gave up runs in the first, second, third, and fourth (3,1,1,2)...notice a pattern? Dan Geise came in and did a good job, going 4 innings and giving up 2 runs while saving the rest of the pen. It's not like the Yankees didn't hit Lester though...they just didn't capitalize on the opportunities they had. In the third, with runners on first and second and nobody out, Derek Jeter grounded into a double play. In the fourth, A-Rod doubled to start off the inning but didn't score. Continuing the futility of the offense...in the fifth, the Yankees loaded the bases with none out and after scoring two (Jeter single and Abreu walk to load em up again), scored nothing else. A-Rod lined out, Nady flew out and Cano grounded back to the pitcher. In any case, the Yankees had to lose sometime, no? It still felt like a bad loss...and Ponson's BAA (over 5 starts) is .322/.378/.469/.847. Umm, yeah, that's not good. Honestly, I wanted Darrell Rasner to be better...I really did, but yeah, not so much. .338/.400/.517/.917 over 9 starts. Help can't come soon enough...and speaking of help, anyone have any idea what happened to Washburn between May 10th and May 21st? Was he hurt or something? Because those two starts HAMMERED his ERA...but he has been lights out since then (2.82 ERA over 71 IP). Dan Angell of The Trentonian spoke with Phil Coke and George Kontos in relation to reports that one of them had labrum damage. Coke says that he hasn't had a physical since spring training. While Kontos simple says that his labrum is fine. Will Carroll reported on Saturday that Phil Coke failed a physical, leading to the Nady/Marte deal leading to the deal being adjusted. However, in relation to Carroll's report, Mike Ashmore says that he'd be surprised if the Yankees would keep throwing an injured pitcher and noted that neither Trenton Manager Tony Franklin, nor Coke, have any idea as to why Coke was taken out of the deal. 07/27: Coke or Kontos Injured? Maybe Not! Yesterday, a Pittsburgh paper had reported that the reason that the recent trade between the Yankees and the Pirates was adjusted, to remove pitchers Phil Coke and George Kontos, was because one of the pitchers had labrum damage. But, according to Peter Abraham, Coke struck out three batters in one inning of work on Friday and Kontos threw six innings, yesterday. So, they both might be OK.
Ken Davidoff reports on the Yankees efforts to get Bernie back to the Stadium, before it closes, so that the fans can thank him. He was invited to Old Timers Day, but apparently has a long planned vacation with his family. The Yankees just keep rolling, this time clobbering the Red Sox by a score of 10-3 en route to their 8th straight victory against teams who started the break ahead of them in the wild card race. The Yanks closed to within one game of the Sox in the A.L. wild card race, and remained three games behind the Rays, who won in Kansas City. Andy Pettitte was pretty solid after a rough first inning in which he allowed two runs. Pettitte more or less cruised through the next five innings, as aside from a home run by J.D. Drew in the 6th, he did not allow a runner to reach third base. He finished with a line of three runs off five hits in six innings. The lineup did a good job against Tim Wakefield and took advantage of a mediocre Red Sox bullpen. Robinson Cano just continues to rake, as he went 3-4, including a game-tying home run in the 4th. He's now got his average up to .270. Alex Rodriguez was on base four times, including a scary moment where he was drilled in the arm by a fastball from Craig Hansen in the 8th. Rodriguez did leave the game, but the Yanks said it was just precautionary and doesn't seem major. Xavier Nady was 0-3 with a walk in his Yankees' debut. The bullpen pitched yet another three scoreless innings, and this time Damaso Marte was in on the action. Marte was brought in to face one batter, and he got the job done as he struck out David Ortiz swinging in the bottom of the 7th. Jose Veras, Edwar Ramirez and David Robertson all had scoreless outings as well, and all three have earned run averages under 3.00. If I told you I wouldn't have been a little surprised if the Yankees would finish out this 9-game stretch after the All-Star break against Oakland, Minnesota and Boston tied for the wild card lead, I'd probably be lying. All three teams were ahead of them when their series with them began, and the Yankees have mowed through all of them so far, and can catch Boston in the standings with a win tonight. There is one problem however: the pitching matchup for tonight is Sidney Ponson against Jon Lester. Ponson will have to cut down on his mistakes and retire some leadoff hitters for once, as he isn't going to get himself out of every jam against this lineup the way he's done it against the Mets, Rays and Twins. It will be a very intriguing game to watch, and could be a major turning point in this season. Game starts at 8:05 ET and will be carried on ESPN. No, not Roger Bannister. Bob Dutton of The Kansas City Star reports that the Yankees are looking at Royals starter Brian Bannister as an alternative to Jarrod Washburn, if that deal falls through. He mentions Melky as the prime chip on the Yankees side in such a deal. Bannister is 27 years old and had his rookie season in 2007. It was an impressive campaign where he went 12-9 with a 3.87 ERA, 1.21 WHIP and .249 BAA in 165 innings over 27 starts (a little over 6 innings a start). However, much has gone wrong for Bannister in '08. In 21 starts, he is 7-9 with a 5.40 ERA, 1.41 WHIP and .284 BAA. July has been the worst month of all, as he is 0-2 with an 8.10/1.65/.321 line in 4 starts. Of course, it's not like Melky's smoking the ball, either. Could a change of scenery give Bannister a boost? The Yankees, like several teams, previously contacted the Royals regarding pitcher Zack Greinke. One major-league source said New York had offered Cabrera and second baseman Robinson Cano in exchange for Greinke and a position player thought to be outfielder Mark Teahen. Goose Gossage will be inducted into the Baseball Hall of Fame, becoming the 35th Yankees player to do so. Congrats Goose! The Seattle Post-Intelligencer is starting to pass around the AP story that Mariners left-handed pitcher Jarrod Washburn is coming to the Yankees in exchange for "several prospects". The New York Post reported late Saturday that Yanks general manager Brian Cashman was given the financial green light by the Steinbrenner family to trade for Washburn, who makes $9.85 million this season and $10.35 million next season. The 33-year old lefty is 4-9 with a 4.75 earned run average in 20 games (19 starts) for Seattle this season. While the Yankees reportedly won't include any of their top-level minor league prospects in the trade, the Post reported that struggling Japanese import Kei Igawa likely will be included. Igawa, who is the in second year of a five- year, $20 million contract, was sent outright to Triple-A Scranton on Saturday. If they're expecting a great haul for Washburn, they really should reconsider. For the luxury of picking up over $10MM of this guy's salary, which Seattle is begging to be rid of, I'll give 'em Igawa and Cody Ransom (that'll clear up a spot for my boy Chris Malec...). The Yankees trade for Xavier Nady and Damaso Marte has been adjusted. Peter Abraham reports that, instead of receiving Phil Coke and George Kontos, the Pirates will receive righty pitchers Dan McCutchen and Jeff Karstens. The Pittsburgh Post-Gazette is reporting, according to a source, one of Coke or Kontos has labrum damage - but, the source would not say who. To make room for Nady (who started today against the Red Sox) and Marte, the Yankees optioned Brett Gardner to Triple-A and DFA'd reliever LaTroy Hawkins. Also, the Yankees took Kei Igawa off the 40 man roster after he passed waivers. Meaning, no one wanted him for free. In his first career start in Fenway Park (and second career appearance), Joba Chamberlain pitched an amazing game, limiting the Red Sox to 0 runs on 3 hits and 1 walk in 7 innings, picking up his third victory of the season. He struck out 9 hitters. The lone run in this game came on a Jason Giambi, two out, RBI single in the third inning that scored A-Rod. Besides that, the Yankees scattered 9 hits and walked once. Bobby Abreu and A-Rod each had 2 hits. Kyle Farnsworth started the eighth and... well... it didn't go so hot. He allowed a single to Jed Lowrie before getting Jason Varitek to foul out. Unfortunately, Coco Crisp followed with a single to put runners on first and second with 1 out for Red Sox leadoff man Jacoby Ellsbury. Girardi decided not to play with the lead and opted to go straight to Mo. Rivera ended the threat by striking out Ellsbury and inducing a ground out to end the inning. Besides allowing a single to Kevin Youkilis, Mo elicited a fly out from David Ortiz and struck out both Mike Lowell and J.D. Drew to end it. Tomorrow, Andy Pettitte (11-7, 3.86) will face Tim Wakefield (6-7, 3.69) at 3:55 PM ET. Hughes is slated to start and pitch two innings on Monday for the GCL Yankees, while Pavano is tentatively scheduled to toss two frames on Tuesday for the same club, assuming that a batting-practice session goes as expected on Saturday. UPDATE: The trade IS to the Yankees. According to one official, Yankees give up 4 prospects, right-hander Ross Ohlendorf (meh with a bit of nuts thrown in), lefty Phil Coke (meh), outfielder Jose Tabata (nuts) and right-hander George Kontos (meh). Man, they really cut up Trenton...taking two starters and a starting OFer...and I think they sold very low on Tabata, who had his first bad year...at AA at a very young age. Of course, those attitude problems certainly did not help. One thing with this trade to keep in mind with this trade. If Nady plays up to par, bye bye Bobby Abreu. Apparently Pirates right fielder Xavier Nady and reliever Damaso Marte have been traded...but the Pirates have not revealed where they are going or for what (though they have confirmed a trade). While details will be forthcoming after medical evaluations, the MLB blurb specifically mentions the Yankees and no other team. Though unconfirmed, the Yankees have been speculated as being on the other side of the deal. Nady started Friday's game and was removed after one inning. Television cameras caught Marte hugging his teammates in the dugout in the second inning, apparently shortly after learning the news. On Thursday night, pitching for the Scranton/Wilkes-Barre Yankees against the Braves affiliate from Richmond, Triple-A starter Ian Kennedy had a no hitter going with one out left in the seven inning game. He induced the grounder he needed, but Chris Basak misplayed it, extending the game. The very next batter doubled, scoring the runner Basak allowed to reach, tying the game at 1. Kennedy was done after seven and did receive a decision. The Yankees won in the bottom of the eighth when Ben Broussard hit a three run, walk off home run. Co-chairman Hank Steinbrenner acknowledged he'd mention Bonds, the indicted home run king who became a free agent when the San Francisco Giants did not bring him back. Ken Davidoff reports that the Yankees have signed catcher Kyle Higashioka, their seventh round pick in this year's draft. Fortunately for Ron Gardenhire, his Twins will never have to step foot in this Yankee Stadium ever again. It must be something in the air here. Whatever it is, the Twins stumbled their way into another loss at the Stadium, as Mike Mussina made it impossible for Minnesota to make up for a myriad of mental mistakes. Mussina shut the door on the Twins, and the Yankees won the game by a score of 5-1 for their 6th straight victory and their 10th straight at home. The Rays and Red Sox both won as well, so the Yanks remain 3.5 and 3 games back, respectively. Moose was on his "A" game all afternoon and gave what may have been his best outing of his stellar season, throwing 8 shutout innings, allowing just six hits and striking out seven. He threw 105 pitches (73 for strikes) and didn't walk anybody. Mussina is now tied for the A.L. lead with 13 wins and has his E.R.A. down to 3.26. If he keeps this up for another two months and keeps the E.R.A. down around the 3.00 mark, could we possibly be talking about Mussina (dare I say it?) as a Cy Young candidate? Neither team was able to push a run across until the bottom of the 5th, when the Twins were just begging the Yankees to get on the board. With runners on first and second with one out, Jose Molina grounded into what should have been an easy double play ball, but Twins 2B Alexi Casilla thought there were two outs and never threw to first to double up Molina. Justin Christian followed that up by doing something the Yankees of the late 90's did that maybe distinguishes them from this team, which is taking advantage of the other team's mistakes. Christian lined a ball down the left field line, scoring both Robinson Cano and Jose Molina as the Yankees went ahead by a score of 2-0. Twins pitcher Glen Perkins was pretty irate, but he made a similar bonehead play in the previous inning, as he failed to cover first on a ground ball hit to the first base side that allowed Bobby Abreu to reach. The Yankees added three more in the 6th, highlighted by a two-run double off the left-centerfield wall by Alex Rodriguez. Richie Sexson was next to hit and brought A-Rod in with a sacrifice fly. Funny how some trendy analysts were trying to label the Yankees as "sellers" during the break because they were a whopping 5.5 games out of the playoffs with 67 games to go. Turns out just a week later, the Yanks are just three games behind Boston and a sweep of this next series would give the Yankees a share of the wild card lead. The Yanks will open up their series at Fenway tomorrow night and the first game will feature a very intriguing pitching matchup, as Joba Chamberlain is set to go up against Josh Beckett. Game starts at 7:05 E.T. I don't know how many people are prospect watchers like me but I just wanted to point out that two of the hottest hitters in the minors right now play for the AA Trenton Thunder. Going into the ninth of tonight's Trenton/New Hampshire game with a 1-1 score, it looked like Austin Jackson and Chris Malec would have their respective 9- and 8-game hitting streaks come to an end. But I guess you can't keep a good hitting streak down...because A-Jax doubled and came around to score on a Chris Malec triple. Malec would then score on a Colin Curtis single (Curtis went 2-for-3 to get his OPS back over .700 after a horrendous June). Over the last 10 games and 36 ABs, A-Jax has just been ludicrous. Check this out...20 for 36 (.556) with 5 XBHs (4 2Bs, 1 HR) and a 6:4 BB:K ratio. He's hitting .397/466/.551/1.017 in July. Yeesh. Almost as sizzling has been Chris Malec, who has put up a tidy 17 for 32 over his 9 game hitting streak. He's racked up 6 XBHs (4 2Bs, 1 3B, 1 HR) and worked a 4:2 BB:K ratio. Oh, and he's hitting .406/.523/.580/1.103 in July. I can understand keep Jackson at AA for a while...but come on, Malec has clearly shown (after a slump at the beginning of the season) that he can handle AA pitching. At his age (26 in a month), give him some ABs at AAA so he can start there next year and possibly help the big league club at some point during 2009. I mean, come on, does he not seem like he would be a more worthwhile option than a Wilson Betemit type? And it's not like the kid is blocked by some superstars. You're telling me he can't take away ABs from 3B Cody Ransom (.256/.325/.481/.806...but 32), 2B Nick Green (29 and putting up a .221/.274/.340/.614 line) or even Eric Duncan (23 but putting up the same line as he did last year at 1B/3B; .241/.304/.399/.703)? "It's not about me. It's about the team now," Posada said. "How can I help the team? That's why I'm going to go through the rehab. If I'm able to hit, I'm going to try to do that. If I'm not able to hit, I'm going to have surgery." Kind of funny how the article mentions him possibly "moving" to DH as if that isn't where he's pretty much been for most of the season, anyway. It does show a bit of a change in Posada's attitude, though, if he is becoming more receptive of the idea of playing first base for more than just the occasional spell for a day off behind the plate. The thing is, I'm not too sure that his shoulder injury isn't negatively affecting his bat. Posada's hit for a putrid line of .197/.324/.246 over the last 28 days. Jose Molina, by comparison, has a line of .256/.347/.279 over the same span. If Jorge isn't going to be much more than dead weight at the plate for the remainder of the season anyway, then it's probably best for him to get the surgery out of the way so he can hopefully come back at full health next year. I think that Posada at 100% in 2009 would be much more valuable to this team than Posada at 40% for the remainder of 2008 and maybe 60-80% for most of 2009. Dan Graziano and Ed Price of The Star Ledger are reporting that the Yankees and Mariners are talking about Jarrod Washburn. Ken Rosenthal discusses the complications of such a deal, namely tied to financials: he has whatever is left on this year's $9.85 million dollar salary as well as $10.35 that he is owed next season. Plus, Rosenthal says, the Yankees would likely have to compensate him to waive his no trade clause, as well. Darrell Rasner started for the Yankees on Tuesday night, holding the Twins to 0 runs on 2 hits over the first five innings. Unfortunately, the Yankees were unable to give him any run support, scoring only 1 run in their first five turns. That run came on a Robinson Cano RBI single, scoring A-Rod in the second. In the sixth, Rasner allowed three straight hits to begin the inning, allowing the Twins to score their first run, on a play where Jason Giambi made an error. He forced a ground out before walking a batter to make it first and second with one out. Jason Kubel grounded into a fielder's choice that, unfortunately, scored a run from second. With a runner on third and Delmon Young at the plate, Joe Girardi opted to go to David Robertson. Robertson got Young to ground out, ending the threat. Even though that would be the only work for Robertson, he would be the beneficiary of a three run sixth. Bobby Abreu homered, scoring Johnny Damon. A few moments later, Robinson Cano singled in A-Rod to give the Yankees a 4-2 lead. The Yankees bullpen was in lock down mode. After Robertson's third of an inning, Jose Veras, Kyle Farnsworth and Dan Giese all pitched scoreless innings, with the only hit being off of Giese. Farnsworth even struck out the side. This allow David Robertson to collect victory number 2. His ERA is 1.59. The Yankees added another four runs in the eighth as Jeter doubled home Damon and Gardner, Abreu doubled in Jeter and Giambi singled home Abreu. Offensively, Johnny Damon was 1 for 4 with 2 runs and walks, Derek Jeter was 1 for 5 with a double, 1 run and 2 RBIs, Bobby Abreu was 2 for 4 with a double, a homer, 2 runs and 3 RBIs, A-Rod was 2 for 4 with a double, 2 runs, Jason Giambi was 1 for 2 with 2 walks and an RBI and Robinson Cano was 2 for 4 with 2 RBIs. Cano is now 12 for 23 since the break, with 2 doubles, 2 home runs, 4 runs and 7 RBIs. The Yankees will pick it up again with the Twins tomorrow at 1:05 PM ET. Mike Mussina (12-6, 3.49) will be going for win number 13 against Glen Perkins (7-2, 3.84). The New York Yankees announced today that 15 first-time Old-Timers will attend the 62nd annual Old-Timers' Day at Yankee Stadium on Saturday, Aug. 2. This season marks the final time that Old-Timers' Day festivities will take place at the current Yankee Stadium, as the club will move into a new Yankee Stadium across 161st Street in 2009. Introductions are scheduled to begin at 1:45 p.m. with the traditional Old-Timers game to follow. The Yankees will then host the Los Angeles Angels of Anaheim at 3:55 p.m. Among the newcomers are seven members of the 1996 World Championship club, including Yankees Special Assistant to the General Manager Tino Martinez, Pat Kelly, Jimmy Key, Graeme Lloyd, Ramiro Mendoza, Jeff Nelson and Tim Raines. Baseball's all-time stolen base leader Rickey Henderson will also make his first Old-Timers' Day appearance at Yankee Stadium, along with current pitching coach Dave Eiland, former manager Buck Showalter and former coach Jeff Torborg. The first-timers are rounded out by Don Baylor, Tony Fernandez, Wayne Tolleson and current YES Network broadcaster Al Leiter. Joining the rookie Old-Timers on the baselines will be over 50 additional former Yankees, including at least one player from each of the last 16 Yankees World Championship teams since 1947. This year's ceremonies will mark the largest number of Yankees alumni in uniform for Old-Timers' Day in the history of the event. Bob Raissman reports that Mary Ann Kaat, the wife of former Yankees pitcher and broadcaster Jim Kaat, has passed away. Heartfelt condolences to Jim Kaat, whose wife Mary Ann, 64, died yesterday after suffering complications from the bladder cancer she was diagnosed with in 2004. Kaat, who retired from the Yankees Entertainment & Sports Network booth following the 2007 season, said the family will hold a private service in Ripon, Wis. A celebration of Mary Ann’s life will be held later this year at Kaat’s Florida home. Our thoughts are with the Kaats and those close to them. MLB.com's Willie Bans reports that Hideki Matsui was advised to have surgery on his knee, by the orthopedic surgeon who examined him on Monday, Dr. Scott Rodeo. However, as reported, Matsui refused and will attempt a comeback one more time. 07/21: Really Bad News: Posada. Good News: Damon. Just News: Matsui. Jorge Posada is on the DL and may be out for the rest of the season, says Tyler Kepner. Posada says that he can't catch because every throw hurts. He's due to have his shoulder looked at tomorrow and then we'll know more. Kepner also reports that Johnny Damon is back, in Posada's roster spot, and he is starting tonight at DH, batting lead off. Finally, Ed Price reports that Hideki Matsui has opted to try coming back one last time before having surgery. The news comes after Matsui was examined today by orthopedic surgeon Scott Rodeo. Dr. Rodeo performed knee surgery on Matsui last year. Well, the Yankees offense was not very useful yesterday...but I guess when you are facing the guy with the best ERA in the league, you can claim that as an excuse. Also, they were facing the A's who are the third worst offense in the league (1-Seattle, 2-Toronto) so maybe they thought they could leave the lumber in the clubhouse. In any case, they scored just enough runs to win as Andy Pettitte backed up his call for the Yankees to play better by pitching a great game. Andy went eight innings and only gave up four hits with no walks (with 6 "1-2-3 innings"). His lone earned run came in the sixth when Jack Hannahan (who did not bring in his animals...) doubled to start off the inning and came around to score on a Ryan Sweeney single. The Yankees score their first run in the third when Derek Jeter doubled with one out, took third on a Abreu single and came around to score on a A-Rod sac fly. They scored the go-ahead (and only other) run in the bottom of the sixth when Jason Giambi got enough of an inside fastball to get it over the RF wall. With a 2-1 lead going into the ninth, Mo came in...and things got a little wacky. With one out, Ryan Sweeney singled and was on first when Bobby Crosby hit what looked to be a routine fly ball to right. Unfortunately, Bobby Abreu lost the ball in the sun and flubbed it. However, Sweeney was already heading back to first and say what you will about Bobby's defense, he still has a strong arm...though not an accurate one as his throw overshot 2nd (and a leaping Jeter). However, A-Rod was backing up Jeter and snared the errant throw underhanded it over to Derek who JUST beat Sweeney to the bag. 2 outs. At that point, the A's put in Rajai Davis as a pinch runner for Bobby Crosby and after waiting out a pickoff and one pitch, Davis took off for second. Clearly, Davis didn't know who was behind the plate (and picked the wrong pitch to run on, a 93 mph fastball that got to home plate very quickly) as Jose Molina nailed him for the last out of the game (and upped his CS rate to 49% in the process). Great win for the Yankees as they swept the A's while the Red Sox were getting swept and TB was losing 2 of 3. They've put themselves back into the conversation for major contenders for a playoff spot...and now they just have to keep it up. They've got a very important 3 game set with Minnesota, who leads them in the Wild Card race, coming up. 2 out of 3 against Minny would be very helpful (and impressive as the Ponson/Rasner combo has been far more lucky than good) as Boston takes on Seattle (who are putting up their best pitchers so it could be tougher than you think). The Yankees opted not to take Johnny Damon off the DL today, writes MLB.com's Willie Bans. "I'm pretty upset right now," Damon told Bans. "This could just be a today thing. I wish I had more answers. Lots of things are just going back and forth in mind, saying, 'When's the day I'm going to actually start playing?' I have no idea." Nonetheless, the Yankees are being cautious. Cashman says he may go on a rehab assignment. The Yankees are now off to a 2-0 start since the All-Star break, and if they can escape with victories in games like the one they took on Saturday they'll be in pretty good shape. Neither team really brought their "A" game and gave the other plenty of opportunities, but it was the Yankees who came out on top in the end after Jose Molina was hit by a pitch with the bases loaded in the bottom of the 12th for a 4-3 victory. The Yanks remain 5.5 games behind Tampa Bay for the A.L. East lead, but pulled to within four games of Boston for the wild card, who lost in Anaheim. The Yankees jumped ahead 2-0 in the bottom of the 2nd and it looked like they would roll, as Joba Chamberlain was dealing once again. Joba struck out eight in six innings of work, with the only run allowed being off a sacrifice fly by Ryan Sweeney. The A's were able to tie the game in the 7th, though, and Jose Veras got an undeserved smattering of boos after a rough inning in which he allowed the tying run on a wild pitch. What was frustrating about it, though, was that he would have gotten out of the inning unscathed if it weren't for that wild pitch, as the other two men on base were left on. The game remained tied until the top of the 9th, as the A's deviated from Billy Beane's style a little bit and manufactured a run off of Mariano Rivera. After a leadoff single by Jack Hanahan, Rajai Davis pinch ran and stole second base. Ryan Sweeney then brought Davis in with a scorching single to left. Now here's the part where both teams begged to lose this game. Jason Giambi leads off the bottom of the 9th with a walk, who is subsequently pinch ran for by Justian Christian. With Jorge Posada at the plate, Christian attempts to steal second and trips and falls halfway there and is tagged out before Posada grounds out to first. After Robinson Cano doubled to left, it looked like the Yankees had by all accounts given this game to the A's, as not only did Christian blow it by tripping over himself, but he probably could have scored from first on Cano's double. Fortunately for the Yankees, Huston Street didn't want to put this game away either. On an 0-2 count, he served an outside breaking ball to Wilson Betemit, which was promptly served back into left centerfield, scoring Cano to tie the game. The Yankees blew opportunities again to score in the 10th and 11th innings, but the A's didn't even give the Yankees a chance to screw up in the 12th, as Jose Molina was hit by a pitch with the bases loaded to end the game. Not the prettiest win for the Yanks, but it was a win nonetheless and a win they needed. Coming into this series, there were three teams ahead of them in the wild card standings and the Yankees are playing them all consecutively, so this is a potentially huge 9-game stretch. The Yanks will try to start off that stretch with a sweep this afternoon as Andy Pettitte will face all-star Justin Duchscherer in a battle of 10-game winners. Game starts at 1:05 E.T. and will also be carried on TBS for those of you outside the New York area. Billy Traber was optioned to Triple-A to make room for Richie Sexson, prior to yesterday's game, reports Chad Jennings. On Friday night, the Yankees picked up a win in their frst game back from the All-Star break, beating the Athletics, 7-1. New Yankee Richie Sexson contributed in his very first at bat, sending an RBI single to center, scoring Abreu for the Yankees first run, tying the game in the bottom of the first. Mike Mussina started and, after allowing 1 run in the first inning, was marvelous once again. He threw 6 innings, allowing 9 hits with no walks and striking out 6. He collected his 12th win of the season and knocked his ERA down to 3.49. The Yankees bullpen was a model of perfection, throwing 3 scoreless innings, failing to allow a single runner to reach base and striking out 6. David Robertson, Edwar Ramirez and LaTroy Hawkins each threw an inning, with Robertson striking out the side in his. Edwar picked up 2 Ks and Hawkins had 1. Cano was 2 for 4 with a three run home run. For his career, after the break, he is a .334 average/.366 on base percentage/.540 slugging percentage hitter. This season, coming into today, he was .246/.285/.358. If this game and his history are any indication, we're in for a serious rebound. A-Rod also homered and collected a pair of singles, going 3 for 4 with 2 runs and 2 RBIs. Bobby Abreu was 2 for 5 with a double, 2 runs and 1 RBI. Melky collected 2 hits, as well. Tomorrow afternoon, the Yankees will send Joba (2-3, 2.62) to face Scott Gallagher (4-4, 4.25) in his second start since being acquired in the Rich Harden deal. Game time is 1:05 ET. Richie Sexson has reached a deal with the Yankees, according to ESPN. Sexson hit .218 with 11 home runs and 30 RBI in 74 games this season for the Mariners. Sexson has hit for some pretty crazy numbers against lefties (.344/.423/.623) this season, but has been dreadful against right-handed pitching (.178/.281/.304), so it's likely he'll be seeing some limited playing time as he finishes out this season in pinstripes. Not sure this move really does anything for me...he's basically just Shelley Duncan with a bigger name and smaller forehead. Damon sprained his left shoulder July 4 running into the left-field wall at Yankee Stadium. He is eligible to come off the disabled list Sunday, and still hopes he can do so, but that seems unlikely since he has yet to hit off a tee. "I'm trying to shoot for Sunday," Damon, who has been getting treatment at the Yankees' facility in Tampa, Fla., said by phone. "I would love to be back on Sunday. But we'll just have to see. I think definitely in a week." 07/17: Should the Yankees Record Bob Sheppard's Voice for the Future? CNBC's Darren Rovell floats an idea I've heard before: that the Yankees could record Bob Sheppard's voice with the idea of having him announcing the players indefinitely. I'm of two minds on this. I love Bob Sheppard, as most Yankees fans do, I'm sure. His voice has been an integral part of the Yankee Stadium experience for a long time. He's a legend. At the same time, change is a part of life and nothing lasts forever, even if we want it to. Is a digital Bob Sheppard an adequate representation of the man himself? One day, hopefully not soon, Mr. Sheppard will pass away. What we are talking about is having the voice of a man who is no longer with us, "reading" the names of players who were born after he was already gone. Is there not something about this that is a little creepy? Mr. Sheppard is a member of the Yankees fan family, if you want to call it that: Yankees fans, as a whole, love the guy. So, consider it like you might consider a member of your own family that has passed away. If you heard their voice mentioning a new song or movie that was just released, how would you find that experience? It's an interesting question. I'm going back and forth on it, really. If it was limited to just the lineups and pitching changes, etc., then it might be neat. But, will it still be eerie? Pardon the delayed recap...I wanted to make sure this game was actually over first. Last night's/this morning's MLB All-Star Game was one that won't soon be forgotten, as the 15-inning marathon at Yankee Stadium was the longest All-Star Game of all-time, and tied the 1967 game for the most innings played in an All-Star contest. The AP has the story. Ed Price says that it is now "more likely than ever" that Matsui will require season ending surgery. Peter Abraham reports that Derek Jeter will bat second in today's All-Star game, while A-Rod will bat fourth. 5 Games over at the ASB and 5.5 GB of a playoff shot (that's an 18% shot of getting into the playoffs. That's where today's 4-1 loss leaves the Yankees. If anything, this game was pretty indicative of the Yankees woes this year. The Yankee offense was pretty much non-existent and the Yankees pitching, while ok, just wasn't good enough for the win. A.J. Burnett, pitching on 3 days rest, came within two outs of a shutout and only gave up one run (a solo shot by Giambi in the 9th) over 8 and a third, giving up six hits, walking and stirking out eight in the process. For the Yankees, Andy Pettitte took the mound and gave up 4 runs the Blue Jays would score. All the scoring took place in the second, as Kevin Mench doubled to lead off the inning and came home on a Scott Rolen single. An Adam Lind walk put runners on first and second before Marco Scutaro strolled to the plate. Then, in an really odd (and annoying) turn of events, Scutaro tried to get a bunt down and failed (TWICE)...and then, after fouling off a few pitches, homered to left to give the Blue Jays a 4-0 lead. Going into the ASB at 5 over when they could have been making up ground on the Rays (who just finished losing 7 straight) is just plain disappointing. Catching the Red Sox for the AL East will be an achievement...but people really shouldn't be banking on a straight freefall from the Rays. Yes, they just lost 7 straight...but they are still in command of the Wildcard spot even after that horrific run. They have a good hitting, good fielding young team...and a nice list of prospects that they are apparently ready to part with to shore up their team for the stretch run. Heck, there are rumors of a trade from Oakland that would add Huston Street and Matt Murton to the team for a few prospects. This is going to be a tough and certainly interesting second half of the season...so here's to hoping that it's not as frustrating as the first half of this season. In what seems like an afterthought after news of the tragic passing of Bobby Murcer, the Yankees defeated the Blue Jays by a score of 9-4, following a two-hit dud last night against Roy Halladay. All 13 of the runs scored in the game came in the first four innings. The Yankees bounced back after a four-run first for the Blue Jays, scoring four of their own to take a 5-4 lead. The Yankees scored at least one run in each of the first four innings, capped off by a solo shot off the left field foul pole by Alex Rodriguez, who passed Mickey Mantle for 13th place on the all-time home run list. Derek Jeter hit a milestone home run of his own as well, as he led the game off with the 200th dinger of his career. Darrell Rasner was a bit shaky once again, but was good enough to pick up his 5th win of the season. Rasner allowed four runs in the first, but didn't allow another, as he got out of a bases loaded jam in the 2nd and worked his way out of trouble a couple more times in the 4th and 5th innings. Rasner finished with a line of four runs off seven hits and six strikeouts in five innings. The bullpen was excellent once again, as Edwar Ramirez, Jose Veras, Kyle Farnsworth and LaTroy Hawkins combined for four scoreless innings and allowed just one runner to reach base. The Yankees came into the game with a bullpen E.R.A. of 3.52, which is second in the American League only to the Tampa Bay Rays. The Yankees will try to finish their "first half" of the season on a high note tomorrow afternoon, as Andy Pettitte will take on A.J. Burnett before heading back home for the All-Star break. Game starts at 1:07 E.T. YES has just announced shortly after the conclusion of today's Yankees game vs. the Blue Jays that longtime announcer and former player Bobby Murcer has passed away at the age of 62. Hey, you can sum up last night's game in two words, Roy Halladay. He was brilliant, facing only 31 batters and using 113 pitches to toss a complete-game two-hitter (and one of those hits was in the ninth) and leading the Jays to a 5-0 win over the Yankees. The Yankees couldn't do anything against him all night long...which made for a VERY quick (2 hrs, 21 mins) game. In opposition, Joba wasn't bad in his start...but on a day where he had to be practically perfect just to keep the Yankees in the game, he was merely effective. He gave up 3 runs over the course of six and a third. In the third, he gave up two singles to lead off the inning and both of those runs came around to score on a later single and a groundout. He gave up another run on Rod Barajas' 8th homer of the season in the 6th. Billy Traber (why he has a roster spot over Scott Strickland is beyond me) came in for an inning and a third and gave up 2 runs on a double followed by a HR to Matt Stairs. Now the Yankees have to win 2 in a row to win this series and head into the ASB +7 games over .500. I was hoping for a nice round +10...but with the way this season has gone, I will gladly take what I can get. Let's go Darrell Rasner...and let's hope those adjustments he made actually have a positive effect. Joel Sherman reports that the Yankees are considering signing the recently released Richie Sexson. Though he's been awful overall, Sexson has victimized lefties to the tune of Sexson did hit a .344 average, 423 OBA and a .623 slugging percentage. Former Yankees first round pick Eric Milton has returned to the club, thanks to a minor league deal, reports Ed Price. Milton is at least six weeks away from contributing anything, thanks to Tommy John surgery. Back in 1998, he was traded to the Twins in a prospect package to acquire Chuck Knoblauch. Cashman indicated to Price that part of the motivation behind the signing is to be able to see what Milton might be able to offer the team in 2009. 07/11: Thanks for the Mustache Love! The Top 10 Jason Giambi Mustache Facts were a lot of fun to come up with, as Seamus, James and myself were constantly laughing as we crafted them. It was also highlighted on Ballbug, which was pretty sweet. While I'm on the subject of press, I may as well mention that YB was recently highlighted by the New York Observer, in regard to our participation in the WCBS ad network. USA TODAY's Bob Nightengale has a nice feature on Hank Steinbrenner. "There's a lot of excitement around here from the Rays fans, but almost to a point of arrogance," he says. "They better be careful. They'll learn this (expletive) can change real quick." "People in baseball know it, whether they want to admit it or not," Steinbrenner says. "It helps everyone when the Yankees are good. The Red Sox, whether they're good or not, doesn't necessarily matter, nationally. … Let's face it: The Yankees are baseball history. You're talking about 26 championships." The article also notes that Steinbrenner plans to hire Lou Piniella as an assistance once Piniella is done managing. Unfortunately, the "Support the 'Stache" campaign fell short, as Giambi finished third in the final vote. Giambi appreciated the fan support. "That's kind of special," Giambi said. "That's definitely come full circle [and] to have that closeness back with the fans again is definitely cool." Evan Longoria took the honors, while Jermaine Dye finished second. If not for a 2 out 2 RBI single by Bobby Abreu in the seventh inning, the Yankees are shut out of this game. That was all the offense they had, as they collected just 7 hits and 2 walks as a unit on the night. For his part, Mussina had yet another solid game, allowing 9 hits over 6 innings, but walking no one and allowing just 2 to score. He was relieved by Jose Veras, who was credited with the loss and gave up 2 runs in the seventh. David Robertson pitched a scoreless eighth. Derek Jeter was the only Yankee to collect 2 hits. He was also hit by a pitch. Justin Christian and Wilson Betemit scored the Yankees' runs. Tomorrow, we'll have Joba (2-2, 2.45 ERA) pitching against Roy Halladay (10-6, 2.88) on 7:07 PM ET, in what will be a rematch of Joba's first career start. The Clarion-Ledger is reporting that the contract talks between the Yanks and their second round pick in the MLB Draft, Scott Bittle, have stalled thanks to concerns over his right shoulder. At stake between the two parties is negotiating leverage, which could mean a sizable difference in his signing bonus. A late second-round pick can expect to receiver around $500,000. "It's been a surprise," said Bittle, who is living in Oxford and working out. "My arm felt good all season and it feels good now. The Yankees want to be cautious and I understand that. But I've got to be smart from my standpoint, too." Peter Abraham checked into it and says that the Yankees want to pay Bittle a reduced bonus at the start, but make it up to him if he proves to be healthy and is able to pitch. Here's a down way to end the day: Bob Sheppard will miss the All-Star game festivities. We hadn't heard anything about him participating for sure, so this isn't a surprise, but it's still a disappointment that he won't make it. Get well soon! I don't think anybody knew what they were expecting to see out of today's matchup, with the up-and-down (usually up vs. the Yanks) Edwin Jackson facing the inconnsistent Sidney Ponson. Both were on their games this time as the Yankees squeaked by the Rays by a score of 2-1, pulling themselves to within 6.5 games of first place. The Yanks remain 4.5 out of the wild card, thanks to the Red Sox' 18-5 pounding of the Twins. Sidney Ponson pitched what was probably the best of his three starts in pinstripes so far this season, allowing only a run on five hits in 6 innings. Aside from a home run he allowed in the 6th, Ponson allowed only one runner to reach third base. He probably could even have come out for another inning or two if they needed him, as he threw only 87 pitches (57 for strikes). The Yankees were first to strike, as Jason Giambi's Mustache brought in Derek Jeter from third to put the Yanks up by a score of 1-0. That was the only run scored in the game until Sidney Ponson coughed up a game-tying home run to Yankee killer Carlos Pena. Both bullpens were equally as impressive, as both the Rays and the Yankees (Veras, Farnsworth and Rivera) got through the 7th, 8th, and 9th innings without any damage. The Yankees had a chance to win it in the 9th after Justin Christian stole third with one out, but Melky Cabrera struck out with the winning run only a fly ball away from scoring. That was followed up by a pop up to second by Jose Molina. After Mariano Rivera retired the side in order in the 10th, the Yankees got another chance to win it in the bottom of the inning, and this time they delivered. After a one-out walk to Derek Jeter, Bobby Abreu lined a double in the right-centerfield gap, scoring Jeter from first to end the ballgame. It was a solid hit by Abreu, but it cost him an ice-cold Gatorade shower at the hands of Melky Cabrera and Robinson Cano. The Yankees will try to build more momentum after this KEY sweep of the Rays, as they head to Pittsburgh tomorrow evening make up a rained out game against the Pirates. The game will feature the same pitching matchup as the game that was eventually called off, as Mike Mussina will face Paul Maholm. "Just think, the Big G -- an icon," Giambi said. "A fashion icon." He also said that if he gets picked and participates in the Home Run Derby, he might try to recruit Willie Randolph to pitch to him, as that was who was on the mound when he won the contest in 2002. "I could recruit him," Giambi said. "The Big G likes to stir it up." Unfortunately, the article notes that Giambi is currently trailing both Evan Longoria and Jermaine Dye. Mark Newman reports that all three have more than 2 million votes each and that they are all separated by less than 10%. There's still time: vote now. And, if you need convincing as to the power of the 'stache, check out our top 10 Jason Giambi Mustache facts. We've got a little good news on the Hideki Matsui front. Yesterday, Matsui worked with a batting tee, taking 45 swings. He reported no pain. If he continues to be pain free - he could be back with the Yankees some time after the break. However, if he starts to feel pain, that would be a set back and could result in surgery. Andy Pettitte got the better of the Rays on Tuesday night, throwing a 4 hitter through 8 innings, holding them scoreless as the Yankees won, 5-0. Pettitte threw 114 pitches in all (80 for strikes), walking no one and striking out 5. The Yankees gave him all the offense he needed in the fifth when, with 2 outs, Derek Jeter drove a double to deep right, scoring both Jose Molina and Robinson Cano. The Yankees added 3 more runs in the eight, with the first of those coming on a Melky Cabrera solo home run to lead off the inning - his first since June 10. Jeter followed with a single and Abreu doubled him home. Finally, with two outs, Robbie Cano singled in Abreu to make it 5-0, Yankees. Edwar Ramirez pitched a flawless 1-2-3 inning against the top of the Rays' order to seal the deal. Pettitte's ERA drops to 3.93 with the victory (his 10th of the season), the lowest it's been since before his start on May 12. As a whole, the Yankees combined for 11 hits, with Jeter, Abreu, Posada, Cano and Molina each collecting a pair. The Yankees play the final game of this two game set tomorrow at 1:05 PM ET when Sidney Ponson (5-1, 4.19 ERA for the season, 1-0, 5.73 in New York) takes the mound against Edwin Jackson (5-6, 4.08). SG, or "the hardest working man in saber-metrics", has a table detailing AL right-fielders sorted by Total Offensive and Defensive Runs Above Average. Bobby Abreu comes in...DEAD LAST. I knew he was having a not-so-Abreu season (even with what had been a hot start)…but according to this, he’s the WORST RF in the AL! Just barely below average offensively…and by far the worst fielding RF in the league (and I'm looking at Bernie circa '06 levels of bad). Who knew? In honor of the "Support the 'Stache" initiative, we here at YanksBlog.com feel it necessary to do our part. As such, Seamus, James and myself put our heads together to present you with the top 10 facts about Jason Giambi's Mustache (never shall Jason Giambi's Mustache not be capitalized). 10. Jason Giambi's Mustache votes for him online - while he's playing. 9. The scar on Jason Giambi's upper lip is from the first time he shaved his Mustache - a mistake he knows not to make again. 8. Jason Giambi's Mustache makes women want to grow a mustache. 7. When Tom Selleck/Thomas Magnum, P.I. 's mustache prays at night, it prays to Jason Giambi's Mustache. 6. Jason Giambi's Mustache grows faster than Jason Giambi can run. 5. Jason Giambi's Mustache will carry New York, New Jersey and Connecticut's 53 electoral votes in the Presidential election - as a write in candidate. 4. If Keith Hernandez had Jason Giambi's Mustache, he wouldn't need Just for Men. 3. Jason Giambi didn't grow his Mustache - his Mustache grew a Jason Giambi. 2. Jason Giambi's Mustache is the only thing in the world that leaves Curt Schilling speechless. 1. Jason Giambi never took steroids. The grand jury that questioned him mistakenly thought his Mustache was on baseball's banned substances list. The Yankees had discussions with the Indians, but were unwilling to make a deal unless they could sign Sabathia beyond 2008. The Yankees will probably be serious players in trying to sign him when he becomes a free agent after the season. The Yankees approached this in a good way. Inevitably when these potential deals for marquee names in a contract year come up, you have some who say that we shouldn't trade our top prospects for three months of someone. Or, however many months it may be. But, that is pretty much never the case, in actuality. The Yankees are not* going to trade top prospects for a couple of months of somebody. Not for that alone, anyway. What they are trading for, as well, is the ability to sign that player to a long term deal on the spot. Some of us act like it's a given that the player will become a free agent and the Yankees will sign him. Kind of like this is a Madden football franchise. Another side benefit that is forgotten sometimes is that with players like Sabathia, these are Type-A free agents. In other words, when we sign them, we lose our first round pick. So, even if we are lucky enough for him to reach free agency and sign with us, we're still trading a first round pick which equals a top prospect for us, anyway. So, by trading for him now, we beat the rush, get him for sure, get him now when he can help us this season - and keep our draft pick. Since the Indians refused to give us that negotiating window, I'm pleased with how this deal worked out. Though, I'd be lying if I said I wouldn't have liked to have had Sabathia's arm in our rotation right now. * - it could happen, but in general, it's not too likely. Not now, anyway. Pete Caldera reports that Brian Cashman said not to expect Phil Hughes to be ready in August. This now pushes him to, hopefully, being ready in September. Fans can cast their votes for Giambi at www.yankees.com, or by texting ‘A2’ to 36197 (or 88555 for those Yankees fans in Canada). Voting ends at 5:00 p.m. on Thursday, July 10. Yankees fans are urged to vote early and often. By voting online, fans will be entered to win one of five authentic Jason Giambi autographed prizes. The American Mustache Institute officially offered their support for Giambi’s All-Star candidacy today. Giambi is batting .256 (63-for-246) with 13 doubles, 18 home runs, 53RBI and 44BB in 78 games this season, leading the team in walks, tying for tops in homers and ranking second in RBI. He is currently tied for fifth in the American League in home runs, ranks seventh with a .393 on-base percentage and ninth with a .537 slugging percentage. In addition, Giambi leads the AL, averaging one home run every 13.7 at-bats and ranks second with 1RBI per 4.6 at-bats. Nice move here. Jason Zillo, you're a genius. And yes, The American Mustache Institute is a real thing. What a game. What. A. Game. After all the gloom of the first two games, the Yankees ended up exactly where they were when starting the series (of course, with 4 less games to make their move). The Yankees got on the board first with a solo A-Rod HR to left that tied him with Mickey Mantle on the all-time HR list. Next up, another HoF, 3 time MVP award winner named Mike Schmidt. Joba Chamberlain took the mound for the Yankees and was cruising until the 5th innning. Before a single out was made, two straight singles put runners on first and second before a wild pitch walk scored a run. Joba then struck out Julio Lugo and Kevin Cash before Dustin Pedroia singled in two more runs to make the score 3-1. Joba then struck out J.D. Drew to end the inning. The Yankees made the score 3-2 in the sixth when Brett Gardner singled and stole second base and then came around on a Derek Jeter single. David Robertson came in for the 7th and wasn't at his sharpest. He gave up a single to Julio Lugo who took second on a Jeter throwing error. Lugo then came around to score on a Kevin Cash double that made the score 4-2. In the bottom of the inning, the Yankees made their move as A-Rod and Jorge sandwiched a Giambi flyball out with singles to put men on first and third. Red hot Robbie Cano then tripled (thanks to a Coco Crisp throw that went oh, maybe 15 feet?) to tie the game. Of course, with a man on third and one out...Melky Cabrera didn't exactly endear himself further to Yankees fans by grounding out to Pedroia who came home for the easy out. There was some intrigue in the top of the 9th when Sean Casey singled to start off the inning, was replaced by pinch runner Brandon Moss and was sacrificed over to second. At that point, Mo really bore down and got "All-Star" Jason Varitek (who may be a fantastic person but certainly does not deserve to be an All-Star this season) to ground out weakly before throwing 3 change-ups to strikeout Manny Ramirez, who might have been napping because he didn't lift the bat off his shoulders. In the 10th, Robbie Cano led off with a single and took second on a Melky sac bunt. Pinch hitter Wilson Betemit, not exactly lighting it up with Yankees fans either, struck out before Brett Gardner stepped up to the plate. Gardner worked a long at-bat before getting a seeing eye single up the middle and right off the glove off Julio Lugo that scored the winning run. Mark Feinsand reports that, according to a source, the Yankees are planning on sending a scout to give pitcher Victor Zambrano a once over. Zambrano has struggled this year, with an 0-6 record to go along with a 9.45 ERA in the Minors. New York Magazine has a feature on the forthcoming sale of Yankee Stadium assets. After the legendary Boston Garden closed in 1995, auctioneers looking for salvageable memorabilia found highly valuable pieces in out-of-the-way places: An abandoned darkroom was inches deep in vintage photos of Hall of Famers, while the arena’s original blueprints were stashed in a wooden trunk near the roof. It seems safe to say that no such hidden gems will be stumbled upon when Yankee Stadium closes after this season. There’s an entire company that’s been hunting down and selling vintage Yankees memorabilia at astronomical prices for years. Rather, the Yankees will be selling their stadium’s leftovers. If the team is so inclined, one prospective auctioneer says, it could get a couple hundred dollars for the trash cans. Peter Abraham reports that Johnny Damon has been placed on the 15 day DL and Justin Christian has been recalled. The All-Star rosters were announced earlier today on TBS, and MLB.com has the list of participants on their site. Alex Rodriguez and Derek Jeter are both starting in their respective positions, and Mariano Rivera made the team, as well. Jason Giambi, Mike Mussina, Johnny Damon and Hideki Matsui were all left off the roster, although Giambi is a candidate on MLB.com's Final Vote. I'd imagine Giambi will get the nod to replace the injured David Ortiz on the roster, but I could be wrong. I was a little surprised to see Moose left off the team, as well. If only runs were cumulative...If you look at the six games the Yankees have played so far in this homestand, you'd see they've scored 26 runs and you'd probably think the lineup is clicking, but alas 18 of those runs came in one game, and after yesterday's game with the Red Sox, they've scored just 8 runs in the other five games. Luckily for the Bombers, they got a very good start from Mike Mussina and a mostly solid performance from the bullpen, and the two runs they scored were all they needed as they fought off a late rally by the Red Sox and won the game by a score of 2-1. The only offense for the Yankees came via an RBI single by Melky Cabrera in the 2nd and a sac fly by Brett Gardner in the bottom of the 6th. Cabrera was the only Yankee with a multi-hit game. The Yankees were 1-6 with RISP and left 10 men on base. Mike Mussina was on his game again, this time throwing six innings of shutout ball and allowing just four hits, as he picked up his 11th win of the season. Jose Veras and (the dare I say hot?) Kyle Farnsworth pitched a scoreless 7th and 8th, respectively. The game got interesting in the top of the 9th, however, as Mariano Rivera struggled to find his command on the mound. J.D. Drew led off the inning with a base hit for Boston, and then Manny Ramirez was hit by a pitch. Mike Lowell then scored Drew from second with a base hit. Rivera followed that up by hitting another batter (this game featured an A.L. record 7 hit batsmen), this time Kevin Youkilis as the Red Sox now had the bases loaded with noboby out, down by a run. Rivera then gave the crowd a metaphorical "Just kidding!" as he struck out Coco Crisp with the bases loaded, got Jason Varitek to pop out to first and then struck out Julio Lugo to end the game. The Yankees will try to salvage a split in this series tonight and pull back to within four games of the wild card. You couldn't ask for a more different couple of pitchers going at it as the 22-year old Joba Chamberlain and his 98-mph fastball will be facing 63-year old knuckleballer Tim Wakefield. Game starts at 8:05 E.T. and will be carried on ESPN. 07/06: Mariano Rivera: All-Star Game Starter? Peter Abraham pitches the idea of Mo starting the All-Star game, in an open letter to Terry Francona. Here's an idea that would make the game even more special: Name Mariano Rivera the starting pitcher for the American League. What's in it for you as manager of the rival Red Sox? Glad you asked. After Rivera starts, you can use your guy Jonathan Papelbon as the closer. Papelbon is happy, Boston is happy and you win the game. It's a win for everybody. You become the classy Boston manager who recognized the legendary Yankee. The New York fans get to cheer as Rivera warms up to "Enter Sandman," and it's can't-miss television for Fox. There is no downside to this. You'll be an example of good sportsmanship across the country. I'd be surprised if it happens, but it's an intriguing idea. There's a good part of me that would like to see Mariano in his element: closing out a close victory for the American League. Judging by the past 20 years or so, the odds would seem to be in the American League's favor, as the team has gone 16-3-1 in the last 20 All-Star games and 10-0-1 in the last 11. But, what if that doesn't happen? Surely, Francona will get Mariano into the game for an out or, more likely, for an inning - even in a losing effort. What would you rather see: Mariano start the game and throw one inning or Mariano close out a losing effort? How about this one: Mariano starting or Mariano closing out a winning effort? Tough call. If he starts, then he starts and we know where he'll be - but, if he doesn't, he'll still pitch most likely, but the situation is up in the air. I wouldn't be adverse to him starting, but I'd still lean toward him closing. Peter Abraham reports that Johnny Damon is going to be out for at least two games, if not more and that the DL is a definite possibility. Ed Price takes it a step further, citing a pair of anonymous sources close to Damon, who expect the Yankees left fielder to hit the DL. Chad Jennings reports that Shelley Duncan appears to be headed to surgery to repair his injured right shoulder. Duncan told Jennings that it's "not for certain" that the injury will take him out of play for the entire season. Peter Abraham reports that the Yankees have added a pair of prospects from Venezuela to their list of international signees: catcher Jackson Valera and outfielder Ramon Flores. OK, so the holiday isn't actually ruined. I had a great lunch, spent time with the family, got some work done. But, it would have been a bit better had the Yankees won and Johnny Damon not been injured. Let's tackle the game. The Sox won 6-4. The scoring was done in 4 frames, 3 times coming in 3's. The Red Sox scored 3 in the 3rd and the 5th. The Yankees scored 3 in the 1st. And then added 1 in the 9th. The game started on the right note for us. If you score 3 runs in the first inning off Josh Beckett, things are looking good. A-Rod drove in Johnny Damon and Bobby Abreu with an RBI double and, on the throw in, he advanced to third, setting up a Jason Giambi sac fly. Damon wouldn't see much more action as he was injured attempting a leaping catch at the wall. He got the ball in his glove, but dropped it and went down. He left the game and Peter Abraham reported that he had an MRI and has a sprained AC joint (shoulder). He's day to day. The first inning was an indication of what the rest of the game would not be like, as the Red Sox pitchers (Beckett for 6, Hideki Okajima for 2/3, Manny Delcarmen for 2/3, Javier Lopez for 2/3 and Jonathan Papelbon for 1) help the Yankees to exactly 0 runs on 2 hits for the next 7 innings. We'll get to the ninth in a sec. The Red Sox got all of their runs off of Rasner, who lasted 5 innings, allowing 10 hits and 3 walks. The newly promoted Billy Traber pitched a scoreless inning, as did Jose Veras (whose ERA is now down to 2.63). Farnsworth came out to pitch the 8th and faced one batter, Julio Lugo, who was safe on an error by A-Rod. And then the game was delayed, thanks to the persistent rain. By the time play was resumed, Farnsworth wasn't going back out. Edwar Ramirez entered and pitched beautifully, pitching 2 scoreless and striking out 3 while allowing no hits or walks. The Yankees did make a 2 out run in the ninth, but it was too little, too late. Melky led off by fouling out to the catcher and Wilson Betemit flied out to center. Brett Gardner, in for the injured Damon, walked and Derek Jeter came up and doubled him home to bring the game within one swing of a tie. Unfortunately, it would end there, as Bobby Abreu flew out to center. Tomorrow, Mike Mussina (10-6, 3.87 ERA) goes against Justin Masterson (4-2, 3.75) at 3:55 PM ET. Before today's game, Billy Traber was called back up and Alberto Gonzalez was sent down. Brian Bruney began his regan assignment, throwing two innings and allowing one run on two hits. Phil Hughes threw 90 feet off flat ground and, if all goes well, will throw off of a mount within the next couple of weeks. Finally, Ben Broussard is back with Scranton, filling in for the injured Shelley Duncan. Barry M. Bloom of MLB.com has a long interview with Hal Steinbrenner, covering a myriad of issues. Despite the team's success in recent years -- 13 consecutive trips to the playoffs, four World Series titles and six American League pennants since 1996 -- huge revenue sharing payments have resulted in the team failing to turn a profit, Steinbrenner said. Much of this occurred because his dad insisted upon pouring revenue back into the team. "It's frustrating," Steinbrenner said. "People don't realize that for the last 10 years, even when we were winning all these championships, we were not making a profit. People were thinking that we were stockpiling money left and right and that's not the way it is. We won in '96 and lost money. In '98 we came close to breaking even; we made a little bit in some sense. There are things that we are trying to do that will at least get the team back to an even baseline. We have been successful, though, in utilizing the Yankee brand to initiate other businesses like the YES Network." Sidney Ponson did not have his best stuff against his former team, and it looked for a little while the Yankees might waste a good offensive performance after wasting three straight good pitching performances. The Yankees' offense did more than enough and then some, though, as they bounced back from a 7-6 defecit in the 7th and exploded for an 18-7 victory. The Red Sox lost, meaning the Yankees will enter their four-game set tonight with Boston only four games behind them in the wild card chase. The Yankees scored more than twice as many runs last night as they did in the previous four games combined. It wasn't looking good at first for the Yankees, as they fell behind 3-1 early, but a grand slam by Jason Giambi in the bottom of the 3rd put the Yanks ahead by a score of 5-3. A bases loaded walk by Posada in the 5th made it 6-3 and it would have been 9-3 had it not been for a great diving play at first by Chris Davis to rob Robinson Cano of a bases clearing extra-base hit. Sidney Ponson was laboring throughout the game, however, and you're only going to work your way into so much trouble before it catches up to you. Ponson allowed allowed a two-run homer to Milton Bradley and then one to Chris Davis, all before he was able to record an out in the 6th inning before leaving the game, as the Rangers went ahead by a score of 7-6. Ponson finished with a line of 7 runs off 9 hits and 3 walks in just 5 innings. The Yankees would fail to score in the bottom of the 6th after having two on and nobody out as Derek Jeter grounded into a double play to end the Yankees' threat. The Rangers brought in Wilson Madrigal into the game in the bottom of the 7th, who was making his Major League Debut. What ensued is what you might expect fof a pitcher when the first batters you're facing in the big leagues are Bobby Abreu, Alex Rodriguez, Jason Giambi and Jorge Posada. The poor guy allowed 6 runs in just a third of an inning as the Yankees had regained the lead and made it 10-7 before even recording an out. It was a 9-run inning for the Yankees, which was capped off by a three-run homer to right by Alex Rodriguez. Giambi had the go-ahead two-run double in the inning, giving him 6 RBI on the night. The Yankees scored three again in the 8th to make the score 18-7, which would prove to be the final. Brett Gardner finally picked up his first hit in this game, a base hit to right in the Yankees' 9-run 7th. He also had a stolen base and a walk, and was robbed of a hit earlier when he lined a ball right at the pitcher. The bullpen did another solid job, with Edwar Ramirez, Kyle Farnsworth and Latroy Hawkins throwing a combined 4 innings of scoreless ball. Well, here we go. The Yankees can enter Tuesday tied for the wild card or they can be 8 games back. Should be a fun series starting tonight, as Andy Pettitte will take the mound to face Jon Lester. Game starts at 7:05 E.T. Any switch (by either the pitcher or the batter) must be clearly indicated to the umpire. There will be no warm-up pitches during the change of arms. Justin Christian was named an All-Star (the lone Scranton/Wilkes-Barre Yankee on the team). As Chad Jennings points out, Brett Gardner and Dan Giese probably would have made the team had they not been promoted. At the AA level, Trenton OF Austin Jackson, RHP Jason Jones, 1B Chris Malec and C P.J. Pilittere were named All-Stars. Nice work to all of them. Peter Abraham reports that the Yankees have signed three 16 year old ballplayers from the Dominican Republic. They are outfielder Yeicok Calderon and shortstops Anderson Felix and Gian Arias. As an aside, he also adds that the Yanks signed their 29th round draft choice, outfielder Mike Jones. Who? Mike Jones. Chad Jennings reports that Shelley Duncan hurt his shoulder on a diving catch in yesterday's game. Duncan believes he has separated his right shoulder. Meanwhile, after announcing that Alan Horne would be headed to the DL, the Yankees decided he wouldn't be. His pitching coach, Rafael Chaves, told Jennings that "I don't think it will be long [until Horne's next start]." Joba lasted only four innings in this one, thanks to a pitch count of 91 (with only 49 strikes). Only 2 runs scored, however, while he allowed 5 hits and walked 4. When he left the game, the Yankees were down 2 to 1, with the lone run coming on a Robinson Cano RBI single, scoring Giambi. The bulletin was solid in this one. Dan Giese threw a scoreless frame in the fifth. Following Giese, David Robertson threw 2 scoreless innings, striking out 3 and walking 2 while allowing no hits. Wilson Betemit tied the game up in the 6th, with an RBI single that scored Posada. Jose Veras threw a scoreless eighth, but the Yankees offense was unable to get anything going. Mariano Rivera entered in the ninth and immediately ran into trouble, allowing a lead off double to Ian Kinsler, who proceeded to steal third. Michael Young singled him home to give the Rangers the lead. After that, Mo retired 3 of the next 4 batters to keep the Yankees within a run. In the bottom of the 9th, Betemit lead off with a walk and Alberto Gonzalez pinch ran for him. With Jeter on the bench, Girardi allowed number 9 hitter Melky Cabrera to remain at the plate, but didn't call for him to bunt. He swang away and hit into a crushing double play. Jeter got up to pinch hit for Brett Gardner (the 2 hitter) instead - but he never got a chance to hit as Damon grounded out to end it. Frustrating. Damon, Cano and Posada each collected 2 hits. For Cano, this raised his average to .245 or the best it's been since opening day when he went 1 for 3 and was hitting .333. Brett Gardner remains hitless at 0 for 6 now, but he did collect a sacrifice. Tomorrow, at 7:05 PM, we'll have Sidney Ponson (5-1, 3.50 ERA on the season. 1-0, 0.00 as a Yankee) against Luis Mendoza (1-2, 5.40). This could actually work out in our favor. Ponson angling for a little "revenge" against his former team? SI.com has a cool interview with Jeter where he speaks on relationship rumors and more. SI.com: There was also this funny story about something that happened in Miami. Jeter: The parking? That was all made up, man. All made up. SI.com: Really? We had a lot of fun with that story. Jeter: [Laughing] So did my sister. She had a blast with that one. That's really why we don't report that stuff here. One thing I've learned from writing for Bad Boy Blog is that people make up a lot of stuff. Mike Mussina was great and the bullpen was solid as well, as the Yanks as a team allowed just two runs on seven hits. Somehow, though, holding the highest scoring team in baseball to two runs was not enough, as the Yankees managed only four hits and one run. The Yankees lost the game 2-1 and fell 6.5 games behind division leading Tampa Bay. It was kind of a frustrating loss for the Yankees, considering the Rangers lead the Majors in runs scored (458) and still have allowed more runs than they've scored (468). That's compounded by the fact that the Rays and Red Sox are playing against each other, so the Yanks are guaranteed to lose ground on somebody with a loss. The only offense for the Yankees came in the 4th inning, via a mammoth home run by Alex Rodriguez that bounced in the back of Monument Park and landed up in the left field bleachers. Posada doubled later in the inning but was stranded at 2nd. Jason Giambi hit a ball off the right centerfield wall in the bottom of the 6th with two outs, and since he ran hard out of the box and the ball took a weird bounce, he was able to get to third without a throw for his first triple of the season. Makes you wonder how many more doubles and triples would be hit in this league if some players weren't such prima donnas. It's unfortunate that Mussina had to get hit with the loss, because he was on his game last night. Moose threw 103 pitches in 6 innings, striking out 8 and allowing five hits. The Yankees did a good job against most of the Rangers' big hitters, as Ian Kinsler, Josh Hamilton and Milton Bradley went a combined 2-12 (Bradley struck out four times). Michael Young went 3-4, but did not score or drive in a run. The Yankees will try to bounce back tonight as Joba Chamberlain will take the mound and will face Kevin Millwood. Game starts at 7:05 E.T. Aziz has a sizable 12 game lead, thanks to a balanced attack that has him 3rd in runs, 6th in home runs, 8th in RBIs, 7th in stolen bases, 9th in batting average, 4th in wins, 3rd in saves, 7th in strikeouts, 2nd in ERA and 5th in WHIP.